National research assessment exercises are becoming regular events in ever more countries. The present work contrasts the peer-review and bibliometrics approaches in the conduct of these exercises. The comparison is conducted in terms of the essential parameters of any measurement system: accuracy, robustness, validity, functionality, time and costs. 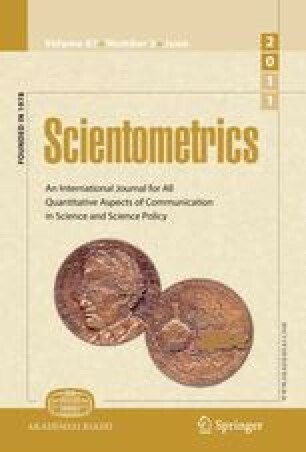 Empirical evidence shows that for the natural and formal sciences, the bibliometric methodology is by far preferable to peer-review. Setting up national databases of publications by individual authors, derived from Web of Science or Scopus databases, would allow much better, cheaper and more frequent national research assessments. Lach, S., & Schankerman, M., 2003. Incentives and invention in universities, National Bureau of Economic Research working paper 9727. http://papers.ssrn.com/sol3/papers.cfm?abstract_id=1158310. REF (Research Excellence Framework). 2009. http://www.hefce.ac.uk/pubs/hefce/2009/09_38/#exec. Accessed 21 Jan 2011.